The Nikon P610 is one of the new bridge cameras from Nikon – it replaces the Nikon P600. Its key selling point is a 60x optical zoom which provides you with an equivalent 35mm focal length range of 24-1440mm. There’s also a digital zoom available to boost that reach by a further 4x, to an incredible 5760mm. Inside the camera there’s a 16 million pixel back-illuminated CMOS sensor. As it is a bridge camera, the physical size of the sensor is the same as is found in many ordinary compact cameras at 1/2.3 inches. Other interesting specifications include a 3-inch 921k-dot TFT LCD screen, which is attached via an articulating hinge to allow you to compose from various awkward angles. It also folds completely inwards to protect the screen when not in use. To accompany that screen, there’s a 0.2-inch electronic viewfinder which has a 921k dot resolution and offers a 100% field of view. Inbuilt Wi-Fi and NFC connectivity is included, allowing you to connect the camera to your phone or tablet to remotely control it or transfer images across for easy sharing on social networks and the like. Full manual control is available, but the ability to shoot in raw format is not. The camera is capable of shooting at a top sensitivity of ISO 6400, while there’s also a Hi1 mode available which allows you to push that up to ISO 12800. The P610 goes against other similarly lengthy zoomed bridge cameras on the market, such as the Canon SX60 (65x) and the Sony HX60 (60x). At first glance you could be forgiven for thinking that the P610 is a small DSLR as it has been designed with somebody who enjoys that kind of shooting experience in mind. Although significantly lighter than the average DSLR, it’s got a certain heft and bulk which lend it an air of quality. There’s quite a large grip, which is coated with a rubberised texture, making it feel comfortable and secure in the hand. There’s an indent on the grip for your middle finger, while your forefinger rests atop the shutter release button on the top of the camera. You can use either the zoom switch around the shutter release button or another switch on the side of the lens to adjust focal length. Just next to the latter switch is a button, which if you hold it down will zoom out of the scene slightly, handily allowing you to re-find an errant subject. Once you let go of the button, the previous zoom length will be reinstated. On the back of the camera you’ll find the articulating screen and the viewfinder. Happily, Nikon has chosen to include a sensor on the viewfinder which will detect when the camera has been lifted to the eye and therefore switching it on, and the screen off. This makes the transition between using the two much more natural and less frustrating than on previous models where you had to press a button every time you wanted to switch between the two. Viewfinder technology has improved significantly in the past few years, and the device found here on the P610 is reasonable to use, offering a clear view of the scene. Although it’s not as large as something you might find on a CSC, it’s quite a step forward from the tiny, low resolution finders of old. To quickly switch between the different exposure modes the camera offers, there’s a dial on top of the camera. Helpfully, Nikon has included a space on the dial for a group of custom settings, which is useful if you’re often shooting one particular type of scene, such as low light. As mentioned earlier, the camera offers full manual control. In order to alter the aperture, you use the scrolling dial on the back of the camera, while a second dial just above the thumb rest controls the shutter speed. If you’re using aperture priority or shutter priority, you’ll only be able to use one of these dials at a time. To alter exposure compensation, you’ll first need to press the right navigation key and then use the scrolling dial to make changes. Happily, Nikon has enabled the selection of a particular autofocus point. From the main menu you will need to choose AF area mode > Manual. After this point you simply press the OK button in the centre of the navigational pad and then use the directional keys to the point you want to use. You can also alter the size of the AF point, choosing from spot, normal and wide, which is handy if you’re trying to focus on something fine. The main menu is relatively straightforward, and is organised sensibly. It would have been nice however to see a quick menu which would allow you to quickly access some of the key settings, such as ISO, metering and white balance, without having to enter the menu at all. On the plus side, there is a function menu which can be assigned to one of nine different functions, allowing you to quickly change something important, such as ISO. Connecting the camera to your phone or tablet via Wi-Fi is very easy. Simply press a dedicated Wi-Fi button and you will see the name of the camera’s network which you need to connect to. Once you have joined the network from your phone, launch Nikon’s free Wireless Mobile Utility app and from here you can remotely control the camera or transfer photos across. Frustratingly however, you can’t change any settings on the P610 from the app, just extend or retract the zoom. 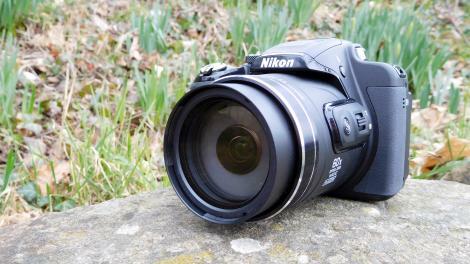 We’ve carried out lab tests on the Nikon P610 across its ISO range for resolution. We’ve also picked out three of its chief rivals so that you can compare their performance directly. Sony HX400V: One of the better bridge cameras around right now, with a 50x zoom offering good performance at both ends of the range. You can’t shoot raw files, though. Canon SX60 HS: Canon’s top bridge camera has a 65x zoom, fully articulating rear display and can shoot raw files. Panasonic FZ1000: We’ve also included the Panasonic, even though the zoom range is shorter, because it has a much larger 1-inch sensor – and this has a dramatic impact on the image quality. We test camera resolution using an industry-standard ISO test chart that allows precise visual comparisons. For a full explanation of what our resolution charts mean, and how to read them, check out our camera resolution test process. Analysis: The Nikon P610 and Canon SX60 show identical results right up to IS1600. The Canon offers better resolution at ISO 3200. Both are slightly better than the Sony HX400V up to this point, though the differences are small and you might not notice in everyday photography. These results are what we’ve come to expect from cameras with 1/2.3-inch sensors. These sensors can give acceptable results at low ISO settings but the quality quickly falls away further up the ISO range. The figures from the FZ1000 are very different. Its larger sensor gives it a clear resolution advantage at low-medium ISO settings, and at higher sensitivities the gap grows larger still. The FZ1000 is more expensive and has a shorter zoom range than other bridge cameras, but the jump in quality makes it worth it, and that’s why the FZ1000 is currently our top bridge camera. I have been very impressed with the colours that the Nikon P610 is capable of producing. They are lovely and vibrant, giving a good level of pop without going too far over the top. This is especially true in good light, which is likely to be when you’re using a holiday camera most. There are four different Picture Control settings available: Standard, Neutral, Vivid and Monochrome. These allow you to give a subtly different look to your images, without the extremes that the Effects mode offers. The latter offers such looks as Toy Camera and High Contrast Monochrome. It’s worth bearing in mind that with both of these, as you can’t shoot in raw format, you’ll be stuck with the look you choose – you can’t change it later down the line. The overall impression of detail from the camera is fantastic when you’re looking at images at normal web or printing sizes, such as A4 or below. This is evident in the shot of the owl (below). However, if you zoom in to 100%, it’s clear to see that some degree of image smoothing is taking place, even when shooting at low ISOs. Given the intended market for this camera, though, the chances of users actually doing this is quite slim, so it shouldn’t present too much of a problem. Looking at images taken at higher ISOs, such as ISO 800 or ISO 1600, there’s even more evidence of loss of detail, but again the overall impression is good – and it’s only from around ISO 3200 that images start to become unusable at all but very small sizes. Helpfully, you can set an ISO limit if you want to only use low sensitivities. The camera’s automatic white balance setting does a good job when confronted with artificial lighting sources to produce pretty accurate colours. It you’re finding that it is erring slightly, then switching to a more specific white balance setting, such as Tungsten, should do the trick. Similarly, the camera’s all-purpose (Matrix) setting, helps to produce accurate exposures in the majority of conditions. I found that I didn’t really need to touch the exposure compensation option in all but the very brightest of conditions, which is good news. Autofocusing speeds are pretty quick in bright light, but they do drop a little when using the camera in darker conditions. If you switch on macro focusing you can get closer to the subject, but occasionally the lens will hunt to acquire focus before locking on. On the plus side, it’s rare to get false focus confirmation. Effects mode won’t be to everybody’s tastes, but I think it’s a fun way to experiment with the look of your photos. My favourite options are Toy Camera and Cross Process, but you may find others more appealing. The 60x optical zoom, while less rare than it used to be, is still a pretty amazing feat and gives you lots of scope when shooting on your holiday or during your travels. Don’t forget that all the focal lengths in between the two extremes of the lens are like having a bag full of different lenses. There a few things which could make the P610 even more appealing, such as a wider maximum aperture at the wide-angle end of the lens, a touch sensitive screen, or raw format shooting. Without these options available, the P610 can never reach true greatness. On the plus side, it probably helps to keep the cost down. There’s a lot of competition in the bridge camera segment of the market at the moment, with Nikon itself launching the mammoth 83x optical zoom P900 bridge camera. It’s starting to make those with 50-60x optics look ordinary, but it’s worth remembering that the P610’s lens still gives you a staggering reach of 1440mm, which should be way beyond the need of most ordinary photographers. The P610, like the P600 before it, is a good, solidly performing bridge camera in a good range of conditions, which should make it ideal for the holidaying and travelling photographer. It’s nice to see full manual control here, and enthusiasts should find it just as enjoyable to use as beginners, who are also well catered for with a range of automatic, scene and creative mode. On the downside, it would be nice to see raw format shooting available here, especially when you consider that the Canon SX60, probably the P610’s nearest competitor, does have that ability.